Pargetting is the traditional art of decorative or ornamental plastering . Pargetting is a form of bas relief (low relief) or wall sculpture. Written records suggest that the craft has been practised since the time of Henry VIII in the 15th century, and reached its zenith in the 17th century. Unfortunately, no pargetting exists from pre-Elizabethan times. Later examples can still be found throughout the country; most frequently, but not exclusively, on timber framed buildings. Today it is mainly found in the Eastern counties of Norfolk, Suffolk, Essex, Cambridgeshire and Hertfordshire, although isolated examples can be seen elsewhere. 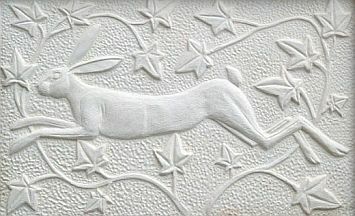 The hare is an example of modern pargetting by Joe Pattison. Joe Pattison is a sculptor and pargeter. His pargeting can be seen throughout East Anglia and beyond. You can commission any motif of your choice, either pargetted directly onto the wall, or as a free-standing panel .